If you have teeth that are missing or need to be replaced, chances are you'll be deciding between a number of treatment options, each of which comes with a price tag. As you're weighing those options, you will probably learn why dental implants are today's premier solution to the problem of failing or lost teeth: They have the highest success rate of any tooth replacement procedure; they are the most lifelike in terms of looks and function; and with proper care, they can last the rest of your life. Implants represent a significant investment for many people; however, when you look at all the options, we think you will find that they also offer the best value. Still, it's wise to weigh all the choices for tooth replacement — even the option of doing nothing. But can you really put a price tag on not taking action? When it comes to tooth replacement, you certainly can... and the true cost of doing nothing might surprise you. The Hope: A Short-Term Gain? In the short run, perhaps, the cheapest option is not to get treatment at all. Of course, you'll still be living with the obvious consequences of missing teeth — not only in terms of your appearance, but also with the difficulties you may experience trying to speak and eat normally, and the loss of self-confidence that goes along with these issues. Plus, there are the less-visible problems — like potential nutritional deficiencies, and an increased likelihood of continued bone loss — that can result from missing teeth. These problems are quite real, but they're hard to put a price tag on. In one area, however, the price of waiting can be measured in dollars. To see how, let's look at what happens inside your mouth when teeth are lost. 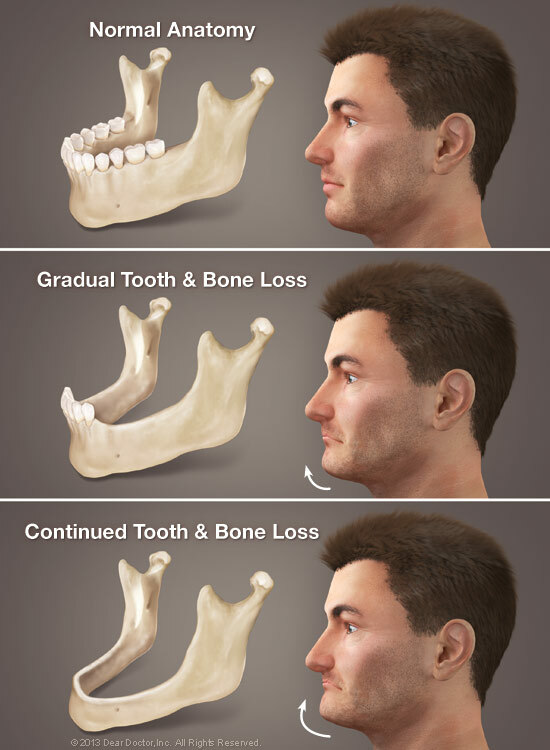 Once you start to lose teeth, the bone in the jaw that formerly supported them begins to deteriorate. Over time, it can significantly decrease in volume and density — and as it does so, it may create changes in the facial appearance. Here's what happens: as you continue to lose more and more teeth, and as the bone atrophies (degenerates), the distance between nose and chin can decrease, the lips curve into a frown, and the lower third of the face partially “collapses.” You may have noticed that people who are missing teeth appear unhappy. Loss of bone structure is part of the reason why. Removable dentures don't solve the problem of bone loss — they generally worsen it. In fact, bone loss is the reason why removable dentures need periodic adjustment and replacement: They put too much pressure on the jawbone, which causes it to erode even faster. At a certain point, treatment may become imperative. The problem is, it's much more difficult to place implants when the bone quality and/or quantity has diminished. Bone grafts may be needed if the area of the missing tooth doesn't have enough bone volume to support the proper size implant. 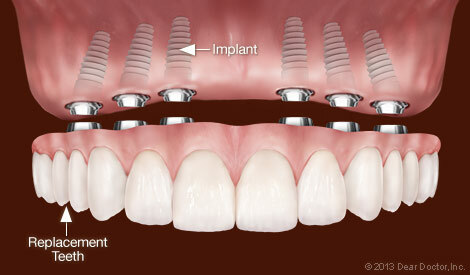 If several teeth are being replaced, it may also be necessary to use up to six or more implants, where only four would have been needed if the situation had been treated promptly. By itself, the lack of sufficient bone doesn't mean that implants are out of the question. In fact, bone grafting is presently a relatively common in-office procedure that can be done as one stage of the implant process. However, chances are that treatment will now be longer, more complicated... and more costly. How much more? That depends on the individual case; however, it's not uncommon to see a 50% increase in the total treatment cost if this type of additional work is needed. You could call that the cost of waiting. So if you're weighing tooth-replacement alternatives, don't forget that every option has its price — even doing nothing. When you consider the real value they offer, we think you'll agree that dental implants are the optimum solution for replacing missing teeth.